The much-maligned, much-mocked Homeland Security Advisory System, a Sesame Street-style color chart designed to indicate to Americans how scared of terrorism they should be, has been in existence since March 11, 2002, when it was signed into existence by President Bush. Now, it’s expected that the Homeland Security Advisory System of color-coded terror warnings will be eliminated by the Obama Administration, to be replaced with some other system sometime in April. Department of Homeland Security head Janet Napolitano is expected to make the announcement today. 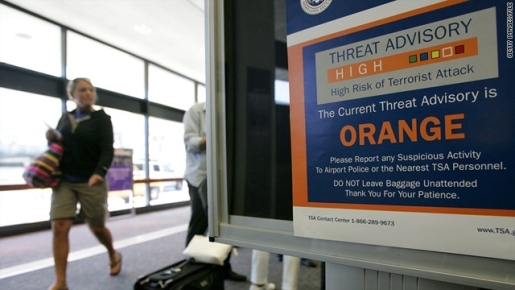 The color-coded threat level system, which contains five levels, is designed to indicate rick of a terrorist attack on America, either in specific situations or in general. The default level is yellow. The five levels are green for low, blue for guarded, yellow for elevated, orange for high, and red for severe. The color code has been elevated to orange only five times and red only once (on the day of the British terror attacks, and then only on flights coming over to the US from Britain).